its not working pls tell me? Get the same problem here. The problem after that it was MainActivity get red. Any clues aboute this error? I had a similar issue, but it was because I did not create the project with the recommended domain. 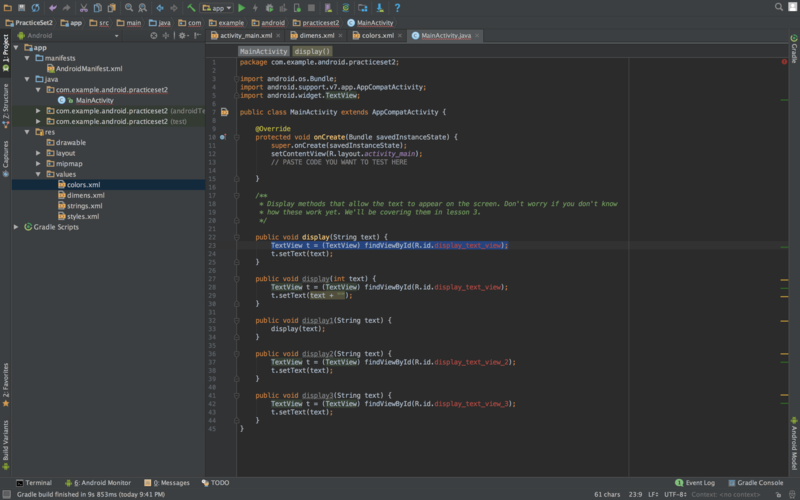 I corrected the domain at beginning of the main activity.java to the one I used, and it corrected the error. If it still doesn't work ,after the changes on tools:context= . Just Rebuild your project (Build-->Clean Project,Build-->Rebuild Project). w.r.t. rdh47, there must be a spelling difference(of your project name) between the one in java code (first line) and the one in xml code (10th line). This was the case with me. 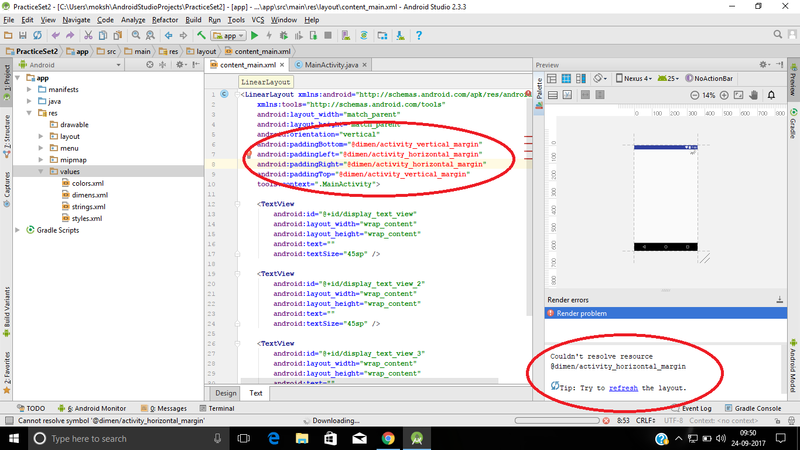 I have the same problem with line number 10, it show .MyActivity with red color, I tried the solution above now show the praticeset2 with red color but it can run without any problem in Andriod Studio but in mobile says you application failed to start. Error:(8, 28) No resource found that matches the given name (at 'paddingBottom' with value '@dimen/activity_vertical_margin'). Error:(9, 26) No resource found that matches the given name (at 'paddingLeft' with value '@dimen/activity_horizontal_margin'). Error:(10, 27) No resource found that matches the given name (at 'paddingRight' with value '@dimen/activity_horizontal_margin'). Error:(11, 25) No resource found that matches the given name (at 'paddingTop' with value '@dimen/activity_vertical_margin'). @gielmude: It doesn't matter, it's just the name of a project you'll probably never publish to the public. So never mind if you misspelled. 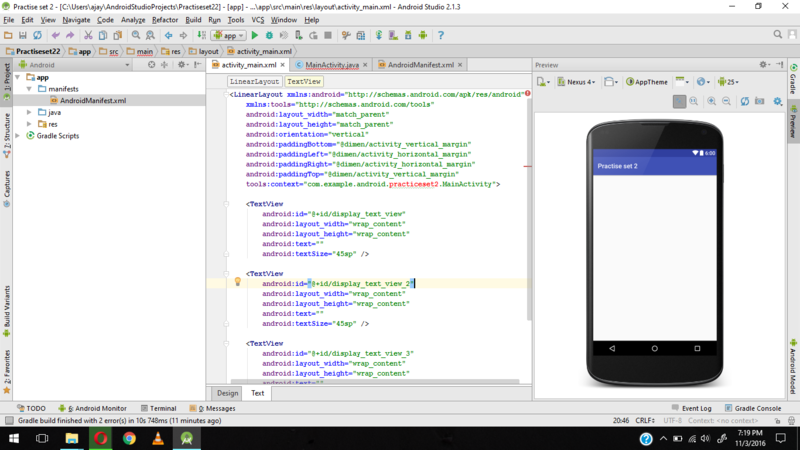 @Prakhar32: in the Android view of the project, go to app -> res -> values. 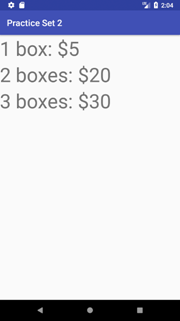 Right click on values, then "New" (right at the top of the pop-up menu), "Value resource file". In the "file name" space, type "dimens.xml" (without the quotation marks " ") and then simply "Ok". "package" in MainActivity.java and "tools:context" in activity_main.xml should be same and proper. @Fedor98: Thanks, that worked perfectly. Following are the instructions of @Fedor98. This instructions resolved the problem that you're facing. 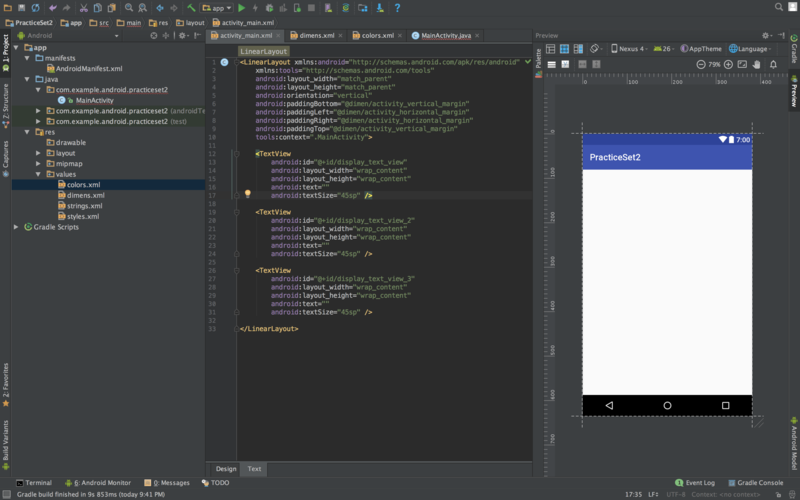 Go to Android view of the project (look to left side of the android studio), go to app -> res -> values. Right click on values, then "New" (right at the top of the pop-up menu), "Value resource file". In the "file name" space, type "dimens.xml" (without the quotation marks " ") and then simply "Ok". it will solve the red MainActivity. @Fedor98 thanks for helping to resolve dimen, you're di man! Thank you all guys! I would have big problems without your advice. @Fedor98 - Thanks for the dimens.xml file tip. That saved me a lot of tears! 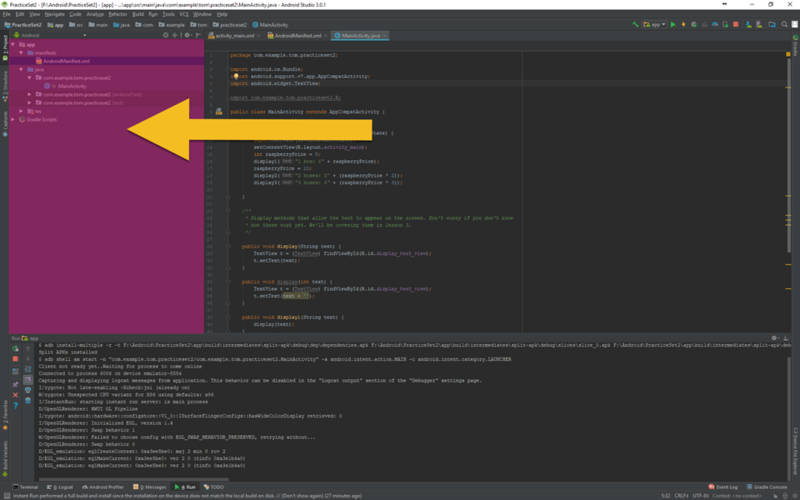 @O-leChuck - I could be wrong but it looks like the @Dimen elements are custom ones, not part of android studio's standard definitions. What @Fedor98's bit of code did was to create two variables named activity_vertical_margin and activity_horizontal_margin in a new resource called @Dimen and assign them both the value 8dp. 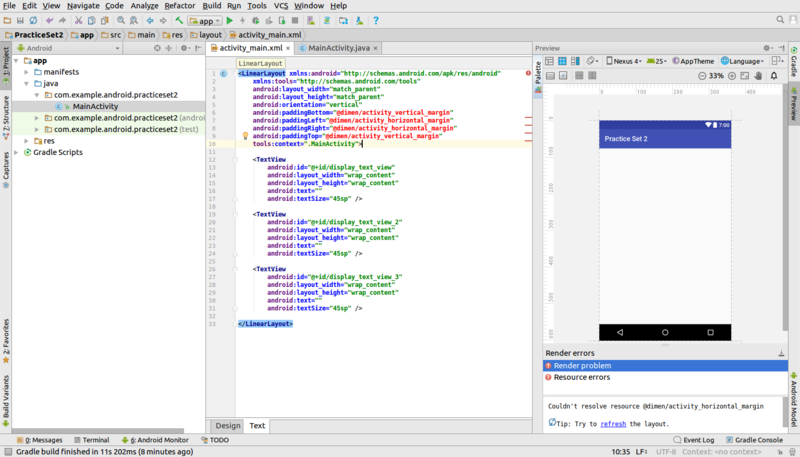 @Wierdgeezer - According to a Stack Overflow answer it is because we are starting from a ConstraintLayout Empty activity. 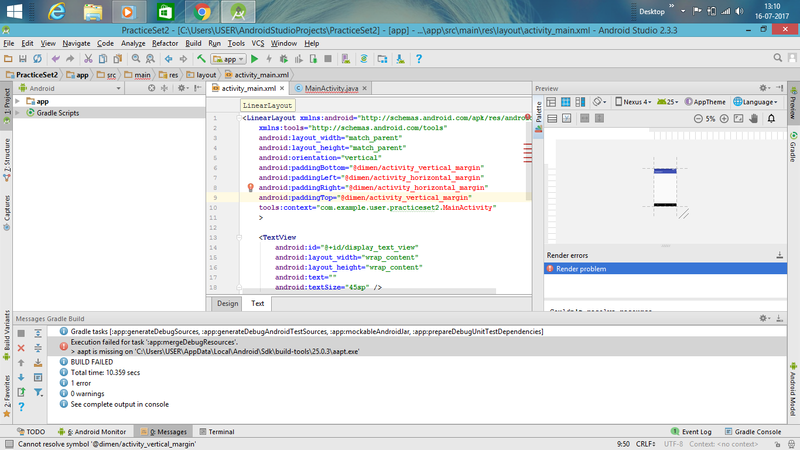 Before Android Studio 2.3 the default activity created dimens.xml. 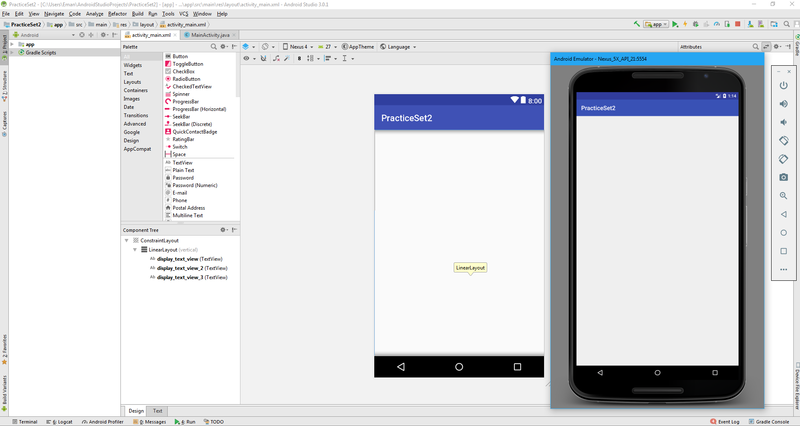 Up to this point I've just been deleting those lines, or replacing android.support.constraint.ConstraintLayout with LinearLayout/RelativeLayout, so thanks @Fedor98. I think the line number 10 is a bit faulty. @Fedor98 you are saving lives... thanks a bunch!!!!! I've been able to resolve it but can I get an explanation on whyit occurred? Thanks to @Fedor98 for the solution! thanks a lot @Fedor98, really helpfull. Hi guys, any thoughts on why line 23 is failing on my main activity? for some reason it cannot resolve display_text_view but as you can see in the activity_main.xml file that id exists. Any thoughts? I got the @Dimen problem as well so I followed the instructions of @Fedor98 but now I'm still stuck. What did you guys write into the new dimens.xml to resolve the problem?? Would highly appreciate some help! ... look out for spaces and other tiny misspellings... extra dot in the wrong place, messes the whole code... it's that kind of business m8! Thank you for all the feedback! And big shoutout to all the students taking the time to help others out. (2) In the LinearLayout, the following padding dimensions have been removed. Including them would require adding a separate dimens resource file (that was not initially included). For the purpose of this exercise, this was extraneous. @FranzoJosefo perform a gradle sync that should solve the problem. 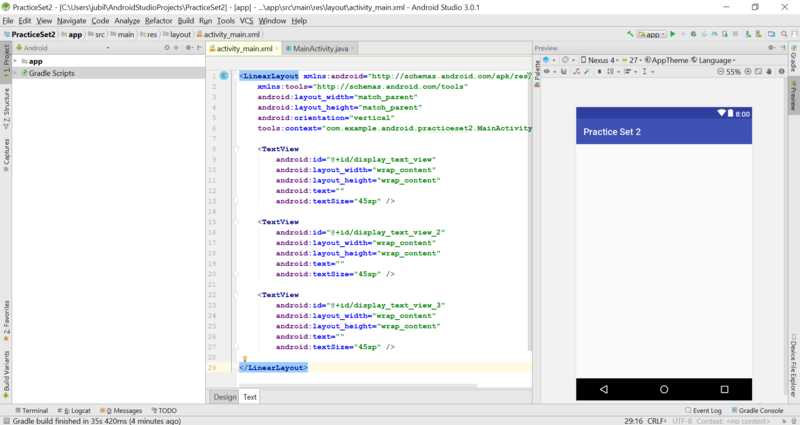 Excuese me @udacityandroid I still having problems with "tools" and they're just solved if a put "MainActivity". If not, all remains like in this image. 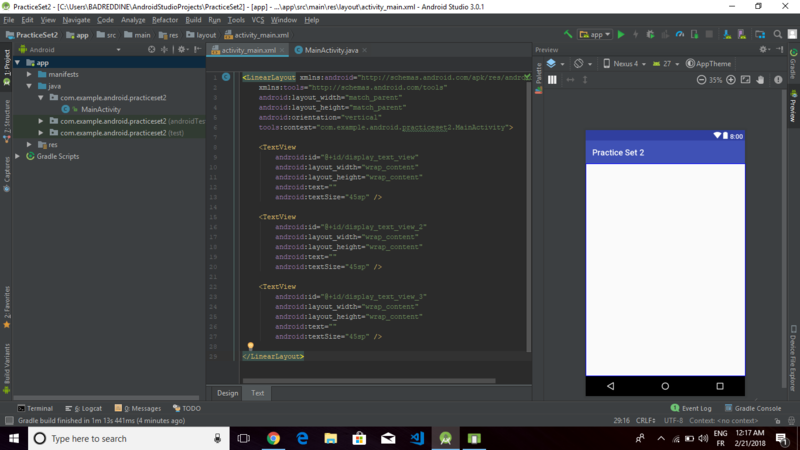 Also, I still having problems on MainActivity.java package it's called package com.example.android.practiceset2; and it's some problem with it statements (I'm attaching a second image for this issue). Could you help me please? I tried all that your commented on this forum, unsueccesfuly. On line 3, copy the value of the package attribute: package="com.example.tom.practiceset2"
On line 7 in your activity_main.xml, paste that value into: tools:context="PASTE VALUE HERE"
Hope this makes sense and it helps! 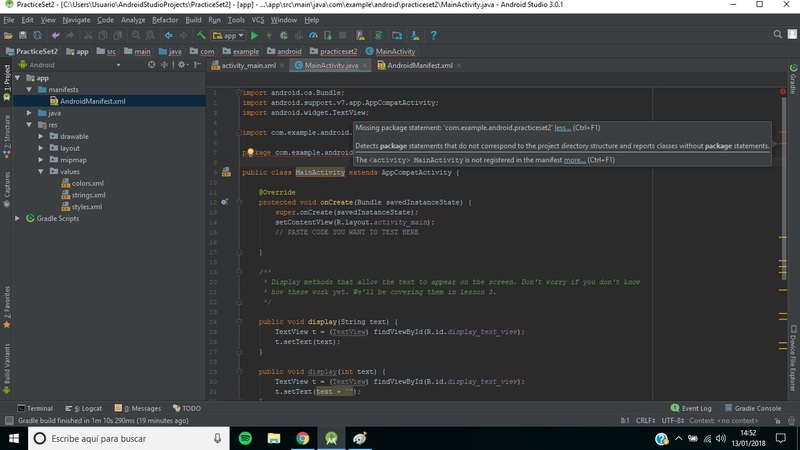 The error message i'm getting is "Typo in word "practiceset"
for some weird reason the android studio misspelt the android.example.com as "andriod" recreate you project and correct it then it will work. I am using a Mac. I hope this helps someone.